« Last Day of Holiday..
And for those who is interested to vote, can either click HERE or check out the poll on my sidebar. Anyway, I would like to say thank you for those who nominated me ^^ and also thousands thanks to those who voted or is going to vote for me. Posted on September 24, 2009 by Jian Akiraceo. This entry was posted in Announcement and tagged best original blog design, nuffnang blog awards 2009, nuffnang blog awards nominee. Bookmark the permalink. So, every finalist have to post a similar post huh as one of the requirement. wah congratulation for being one of finalists…. Wow congratz!!! You’ll have my vote for sure! Congratz Kampung Cat……. Dont worry , we sure 100% support you. Keep up the good Blog. Congrates! the kampung miao sure do us proud! Hehehe ^^ Hopefully I don’t embarrassed you guys. All the best miao, do us proud. Honestly, I’m not surprised that you were nominated cuz your design is really good and original. 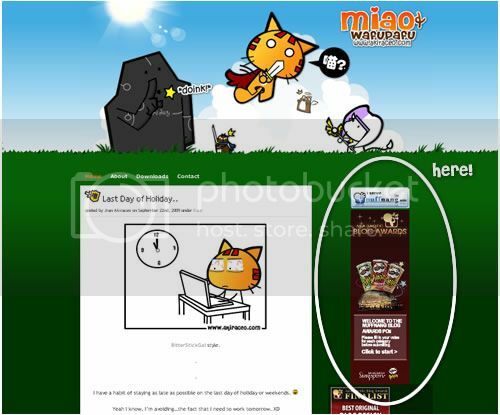 We miao-fans will support you all the way :P. We’ll miao-nap you to be our tour guide in singapore when we go there next time :P. congratulation!!!!!!!! !1 i will vote for YOUUUUUUU!!!!!!!!!! congrats miao!!! have fun in singapore! 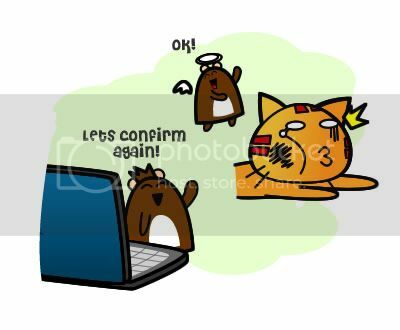 Wahh cannot cannot.. how bout fei zai’s blog? Bro, Congra! Congra! 100% i will vote for you! Then i can meet you in singapore already! I’ve also voted for you!!! ganbatte miao miao! +1 vote! Congrats!!!! Don’t worry the merlion will take good care of miao. They are from the same family =) or should i say long distanced? anyway Congrats!!! and hope to see you in Singapore!!! Congratz & good luck! We Miao fans will support u all the way! you’ve got my vote too! WOW !!! 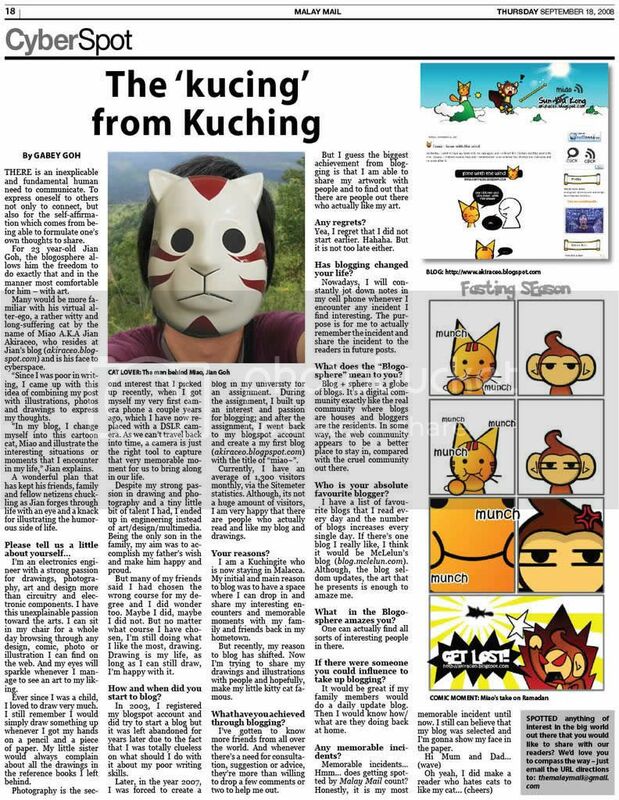 Congratz Mr MIao … hope you win !!!! ( btw voted for you ) Jia You !!!! Win!! Hey… I voted for you lei! no doubt i will vote for you! sy dah vote for miao. klu ini general election miao dah jadi YB Bandar Melaka!!! Hahaha I know you received many congrats d! But juz can’t help it .. Congratzzz Miaooo!!!! Your blog truly deserves It! Happy for you! Take more photo’s at SG and shows us ar! May the cat power be with you wherever you are…even among the merlions. Reply: See you in Singapore!! !